Is someone dreaming of a shed? These free shed plans make a great getaway for the ladies because they can easily be turned into a craft area, TV room, or just a place to relax and get away. Still in the building mood? Get free woodworking plans to build greenhouses, barns, pergolas, garages, dog houses, potting benches, router tables, playhouses, cabins, tree houses, gazebos, porch swings, picnic tables, swing sets, deer stands, bookcases, home bars, wine racks, decks, work benches, chicken coops, birdhouses, benches, and even homes. Popular Mechanics has a great free shed plan available for a 6x8 shed that would be perfect for lawn equipment and gardening tools. Real photos make this free storage shed plan especially easy to follow. If you're looking for a larger shed, you can easily expand the free shed plan for a size up to 8X10. Ana White has designed this free shed plan that uses cedar fence pickets to create a shed that costs around $250 to make. There's a shopping list, tool list, general instructions, color photos, diagrams, and plenty of project photos and tips. This free shed plan builds a 10x10 Gable shed. It's a great plan with lots of explanations and many illustrations to keep you on track. This free shed plan will create a great larger sized shed. You'll feel the extra room in this slightly oversized shed but you won't have to compromise much more yard space to make it happen. The free shed plan here was designed with a budget in mind but you wouldn't know it with the attractive design that features arched windows and a custom door. The directions and illustrated along with actual photos on the free shed plan will make it easy to build your very own shed on a tight budget. This free shed plan is for a storage plan in the style of a one-room schoolhouse. It's a large shed at 10X12 ft. and has double doors, a covered entry, and fiber-cement siding. Step-by-step instructions and a tool and materials list are included in this free shed plan. Here's an interesting plan for what seems to be a small shed but you can easily modify into a smokehouse if you like. The plans include tips, color photos, shopping list, tool list, cut list, diagrams, and step-by-step building instructions. These free shed plans will help you create a 10'X16' colonial style shed that can double for tool storage and as a children's playroom. If you're looking for a free shed plan that will help you build a larger shed that will serve multiple purposes then this one is for you. Here's a free shed plan for a very small shed that's only the size of a closet. It may be just what you're looking for though if you simply need a place to store some basic lawn equipment or gardening tools. A tools and materials list, step-by-step directions, diagrams, and plenty of pictures will help you build this shed. Seven pages of shed plans will help you build a narrow (7 ft. wide by 4 ft. deep) shed for your backyard. 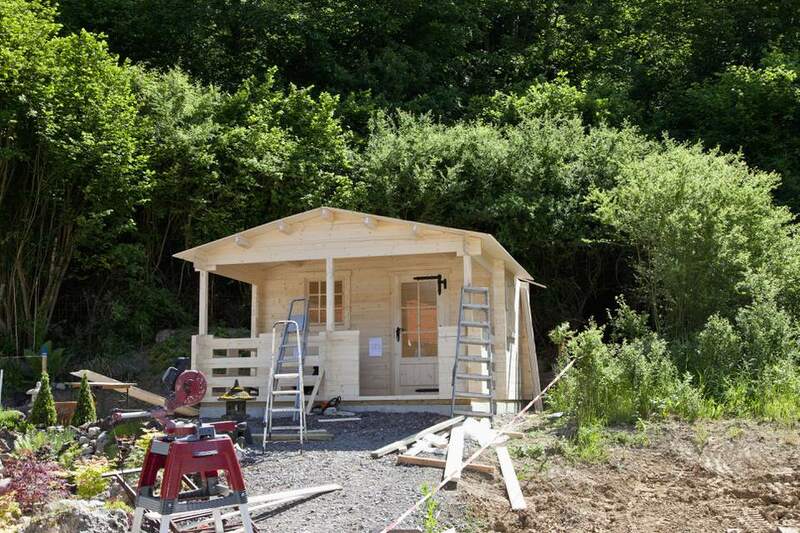 A parts list, blueprints, and instructions will help you build this small but mighty shed. Black & Decker has a free shed plan that will build you this simple storage shed. These free shed plans include a tools and materials list and step-by-step building directions with plenty of pictures and diagrams. After you're finished with this free storage shed plan, you'll have an 8x8 Gambrel storage shed that can be moved in the future if need be. A complete material list makes this free shed plan so easy it can be completed in a weekend. Here's another free shed plan, this one large enough to include a potting bench or workbench and the space to store a ton of your stuff. Download this free shed plan to find a materials list, blueprints, and instructions. Build an 8x7 Tudor-style garden shed with this comprehensive plan from BuildEazy. If you're looking for a larger shed, there are plans available for you to build this same style of shed in a 10x10 size. Use the links at the bottom of the shed plan to go through all the steps of building this shed. You'll impress everyone in your neighborhood by using this free shed plan to build a backyard shed that you can drive your riding lawn mower right into. The combination of illustrations and color photos in this free shed plan will help you build this shed just how you imagined. This free shed plan is for a portable Gable storage shed that's 8x8 finished and build on a skid foundation so it can be moved in the future if needed. You'll find this free shed plan to be easy to follow with illustrated pictures given for each step. A complete material and cutting list are available on the first page of the plans. Just Sheds mostly sells storage shed plans but they do have one free shed plan that will result in a 10x8 storage shed. Click on the picture of the shed to download the free shed plan as a PDF file. 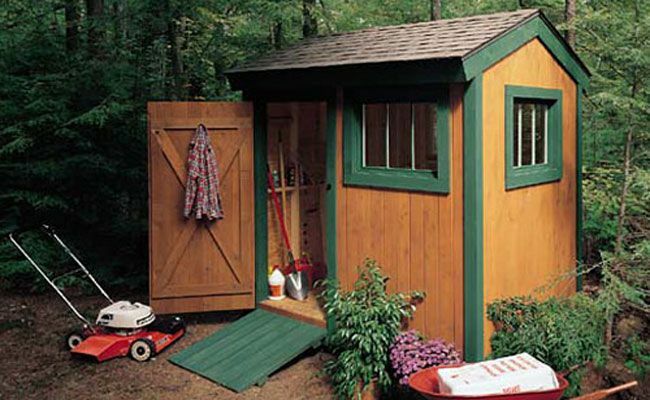 This gabled garden shed is a beauty that includes 80 square feet of work and storage space. A window and workbench make the ultimate potting area inside. This 8x10 free shed plan can be built with a wrap-around deck as well. You'll need to register (for free) to download this free shed plan but then you'll be able to instantly download the material list and plan as PDF files. This free shed plan will build you a 7 ft. x 8 ft. board-and-batten shed. Included in the free shed plan is a parts list, step-by-step instructions, and diagrams. This free shed plan at BuildEazy gives you everything you need to build an 8x10 storage shed for your yard. This free shed plan will help you build a basic storage shed that will be great for all your tools and lawn equipment.